The final Fans Forum of the 2007-08 season was held at Stamford Bridge last weekend, prior to the game against Bolton. On the agenda was atmosphere, Chelsea in the community, the Fans Forum selection process, the annual satisfaction survey and of course, Moscow! First up were matters arising from the previous meeting, where a few points were raised including the coverage of radio match commentary being carried on Chelsea TV for each match, which will be looked into for next season, and a brief update on Chelsea media, which was then deferred to later. The club were thanked for their generosity in supplying free travel and tickets to the Everton match, where we found that not one other Premiership club backed Chelsea in their complaint about the late re-scheduling of the match. Anyone still waiting on a refund for this match will receive it very soon; the cheques are on their way out this week. 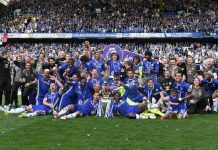 The season ticket renewal date was spoken about as many had received complaints about the cost involved this month, with the Champions League final and season tickets having to be paid for in the same week. The club acknowledged the issue and said they would extend ST renewals until the 6th June, but pointed out that any finance offered would still be on the same terms as normal, and although I asked if this date could be set as standard for future seasons, as it’s hoped we’d be in cup finals most seasons, they only committed to reviewing it on a season by season basis in future. We then spoke of Moscow and a raised a lot of the concerns heard on our boards, as well as those through other groups too. The alleged ‘gulags’ were one that concerned most and the club said much of what was being reported was mythical. Much of the information about Moscow has been released already, but to recap; we were told that supporters won’t be held in the stadium afterwards, and that the supporters of the losing side will be able to leave immediately. We also heard once in the stadium, you can’t leave and then re-enter, so once you are out, you are out. There will also be no alcohol in the stadium. You will be able to visit the city and wander around freely, and the stadium is supposedly around a 25-30 minute walk from Red Square. It will be heavily policed, but this will be more for logistical reasons than the Russians expecting trouble. They want to ensure everyone gets in on time, and out again, safely. You should be aware that Moscow is not an easy city to traverse, and you should take as much travel information with you as you can. There is much of it circulating within our forums, so do please have a read if you are heading out. They will be stricter on public drinking in Red Square, so if asked to bin your beer, just do it. Respect them and they will respect you, the club and police authorities have been in close liaison, neither is expecting trouble but you must behave – and it can be a 72hr stay in the local jail if you don’t. There will be the standard searches coming up to the stadium, including bags, pockets etc, and there will be three checkpoints before the stadium, each with a different level of security. Again, once you go through one, you can’t go back out again. There will be 6000 police around the stadium, around 10% of the crowd. Be prepared to be delayed at the airports, although they can handle the numbers, you will be going through strict passport control and possible bag checking too. 50,000 or so people in a few days with non-standard visa’s is a new thing for them, so may take longer than usual. Your ticket is your visa. DO NOT LOSE IT! You will need it to leave the country as well as entering it, if you lose it you will have to pay €75 to be able to leave the country. You will be stuck at the airport until it is sorted out and that could take a day or so in itself. Of all the information out there, this is the most important. Finally on the subject of Moscow, we were informed that the match had sold out, and before United too. Who’d have thought it? Next up on the agenda was Chelsea in the Community. Now Chelsea does a heck of a lot in the local boroughs, as well as globally with their partners, Right to Play. Their Corporate & Social responsibility program is progressing well with a foundation of community work. Last year saw around 300,000 disadvantaged children benefit via Chelsea’s direct involvement in social inclusion projects in Chelsea, the surrounding boroughs and also in Cobham. The summer soccer schools are all being expanded into Essex, Kent and more London boroughs, as are the breakfast clubs that get kids into school early, feed them with a good meal and set them on course for the day. Chelsea are not going to limit this to only their boroughs any longer, they feel they should be helping as many as they can, and as they are a pan-London club, they will be running these initiatives all across London in the future. They have also been working with the London Development Authority, and with new Mayor; Boris Johnson, on such issues too, as well as getting children into sports as part of the Olympics and East End regeneration projects. CSR has become such a large area for Chelsea now that it needs a permanent person to manage it, as such, Simon Taylor has moved from the press office to become the permanent head of CSR for Chelsea. Last year in terms of CSR, Chelsea FC raised £4.3million for charities, which is way above the 0.7% of revenue that the UN recommends firms donate as a minimum percentage of revenues, outstripping companies such as BP and Marks & Spencer on a percentage ratio. Next up on the agenda was Atmosphere. The club was presented a 10 point plan by the Atmosphere Committee, at the last Fans Forum. Since then a meeting has happened between the directors and the Atmosphere Committee that made some progress in terms of some issues being moved forwards. The club firstly wanted to say that everyone had noticed a difference in the atmosphere this season, and that they were pleased with the progress, and congratulated all involved. There is still much to do, but we are making progress. Acoustics in the Shed End will be re-visited, with an expert in to look at how it could be modified to allow sound to travel better, or be retained within the stand if that’s no possible. There may also be a slight delay in playing music post match, to allow people to enjoy the atmosphere post victory. That’s when we win, of course. We also heard how there may be a new, and even bigger Blue Flag for the MHL, with the current one moving to the Shed End, and we also heard that scarves may finally replace flags in the Champions League next season too. Finally, they also said that a large flag on rollers, that can be pulled down from the back of a stand, like the Fenerbahce one, will also be investigated this summer. They told us that the atmosphere is at its worst with games that have the highest percentage of general sale tickets sold, and also promised more meetings with the Atmosphere Committee this summer, and I’m sure Jerry will keep you posted of events as they happen. We then spoke of TV scheduling and asked how late the TV companies can leave it before switching a game, as they did with the Everton match. Contractually, they only have to give three weeks notice, which is ridiculous considering tickets are on sale four weeks before, and apparently need even less notice as the season concludes. Next up was the Fans Forum selection process. Every two years, half the fans forum steps down and is replaced with someone new, this happens with the representative seats such as Season Ticket holders, and also the permanent seats too, such as ours, the CSG and others. Application to the Fans Forum is open to anyone of the various groups, and you can download an application form from ChelseaFC.com, or by clicking this link; Fans Forum Application Form. We then ran through the results of the clubs satisfaction survey with David Tomlinson of the Leadership Factor, who distribute a survey across all ranges of supporters on their satisfaction with the match day experience. This is the 4th such report in four years, and of 5974 forms sent out to all non-corporate, 1564 were returned, which was a 28.8% response rate, a rise on last years. 20 areas are measured with areas selected by supporters, such as ticket pricing, atmosphere, safety and more. Safety was rated as most important, with club interaction voted least important, somewhat surprisingly. The three lowest areas for satisfaction were food and drink, Premiership ticket prices and also the booking fee. Satisfaction in the atmosphere was the largest riser last season, with the ticket office also being a large mover in terms of satisfaction. Many on the forum agreed that the ticketing office had improved, and congratulated them for the work in these areas. Overall satisfaction was at 67.4% which was a slight decrease on last season, but still three percent up on 2005. Corporate satisfaction was at 72.8%, also a slight drop since last season, but up overall on 2005. The main areas of satisfaction were view, safety and the match day programme availability. Areas of least satisfaction were value for money, speed of service and access to non-corporate seating. Finally we came on to AOB where congratulations were given to the club in getting to the European Cup Final, we asked if there could be a beam back at the Bridge, but this was thought unlikely due to works going on. We asked if there could be one locally, such as on Eel Brook Common or such area, despite known issues with the council for such events, and although they said it would be looked into, it seems this isn’t happening. Chelsea media was discussed, and we heard how the Chelsea website will get a redesign this year, moving away from the fully flash version we see now. Many of you complained about the new site and we took a comprehensive report to the club based on your issues with the site. I’m glad to say that finally they will be reverting to a linear HTML version of the site, with flash components, rather than an overall flash site. There will be an improved stats section, a far better search function and much more content too. As well as this they are also launching a dedicated kid’s website aimed at the 6-12 year olds, which it’s hoped, will help attract even more young supporters. We raised the issue of Spackmans Bar, and how many supporters were annoyed with Nigel Spackman when he declared before the Champions League Semi-final, that he would always be Liverpool, through and through. Many contacted us saying the bar name should be renamed, and the club agreed to do so. Hockings Bar was raised, and I personally like the sound of Canners Bar; for Paul Canoville. If you’ve any suggestions, please air them in our forum and I’ll happily take them forwards. Finally, I spoke about the supporters’ tournament at Cobham. Yes this is happening, on July 5th of this year. We are still sorting final details out, and awaiting any final entrants from the Fans Forum. Once this is done, all information will be distributed, and if spaces allow, external groups will be able to apply to enter a team. I can only apologise for the delay in finalising all of this, but trust me, it’ll be worth it. Very finally, this was my last Fans Forum meeting as I have now served my two years. Jez will be replacing me for next season, and carrying on the work CFCnet does in representing our readers to the club. This is such a large area for us now; we have five people dedicated to it alone. Despite what may be said of the Fans Forum, I do feel it’s a good thing. It’s a heck of a lot of work and I think a lot of people underestimate what goes into it. I’ll be doing a final review of my time on it in the coming weeks, and then, thankfully, for me it’s all over. Good luck to Jez for next season, and thanks to all of you who’ve sent issues in to us, who’ve given us ideas, and worked with us on various different initiatives. We’ve achieved much, but there is still a lot of work to do. Next articleHAVE A GOOD TRIP!